SEAT’s flagship Exeo executive car has been given a facelift, along with an enhanced 2.0-litre TDI engine, which SEAT hopes will achieve emissions of below 130g/km. Both Saloon and ST models have been improved. The new look front end features revised headlights which feature LED running lights as standard on Sport models and as an option on SE grade cars. There are also new alloy wheels and improved upholstery materials. Perhaps more importantly, the 2.0-litre TDI diesel engine has been improved, cutting emissions to as little as 129g/km on the saloon model, with fuel consumption of 57.6mpg. That places it in band D tax, meaning free first year VED and £115 per year thereafter. For company car drivers it means a relatively low 19% BIK rate. 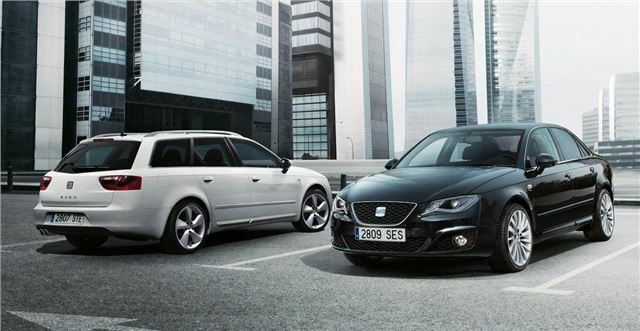 SEAT hopes to further cut CO2 emissions with a new stop/start model, due to go on sale in 2012. The improved Exeo will debut at the Frankfurt Motor Show in September. For more Frankfurt info and news, visit the dedicated page here.